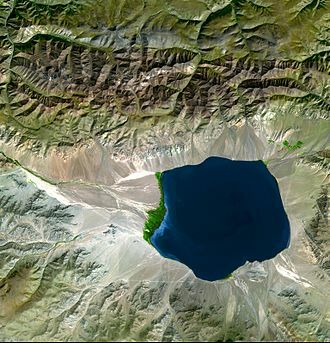 The lake is fed through a series of mountain creeks and drains underground. 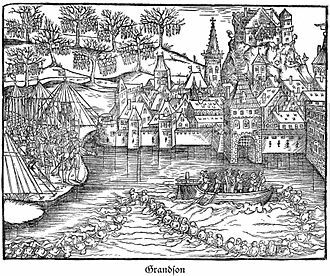 The water then resurfaces as the Oeschibach. Part of it is captured for electricity production and as water supply for Kandersteg. The lake is generally frozen during five months, from December to May. From time to time ice skating is possible on the ice. 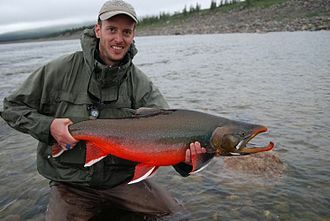 Fish in the lake include Arctic char (Seesaibling), lake trout (Kanadische Seeforelle), rainbow trout (Regenbogenforelle). From January to March, ice fishing is popular. A gondola lift from Kandersteg leads to Oeschinen, 25 minutes by foot from the lake. Since 2007 the lake is part of the Jungfrau-Aletsch-Bietschhorn UNESCO World Heritage Site. 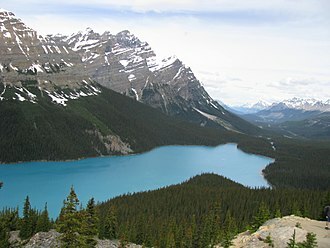 Wikimedia Commons has media related to Oeschinen Lake. 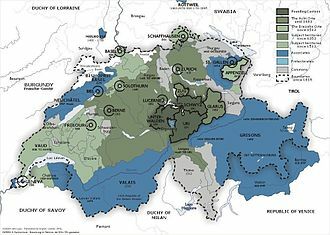 This Canton of Bern location article is a stub. You can help Wikipedia by expanding it. The Eiger is a 3, 970-metre mountain of the Bernese Alps, overlooking Grindelwald and Lauterbrunnen in the Bernese Oberland of Switzerland, just north of the main watershed and border with Valais. It is the easternmost peak of a ridge crest that extends across the Mönch to the Jungfrau at 4,158 m, constituting one of the most emblematic sights of the Swiss Alps. The most notable feature of the Eiger is its 1, 800-metre-high north face of rock and ice, named Eigerwand or Nordwand and this huge face towers over the resort of Kleine Scheidegg at its base, on the homonymous pass connecting the two valleys. The first ascent of the Eiger was made by Swiss guides Christian Almer and Peter Bohren and Irishman Charles Barrington, the north face, considered amongst the most challenging and dangerous ascents, was first climbed in 1938 by an Austrian-German expedition. The Eiger has been publicized for the many tragedies involving climbing expeditions. Since 1935, at least sixty-four climbers have died attempting the face, earning it the German nickname Mordwand. They are both part of the Jungfrau Railway line, running from Kleine Scheidegg to the Jungfraujoch, between the Mönch and the Jungfrau, at the highest railway station in Europe, the two stations within the Eiger are Eigerwand and Eismeer, at around 3,000 metres. The Eiger is mentioned in records dating back to the 13th century, the three mountains of the ridge are commonly referred to as the Virgin, the Monk, and the Ogre. 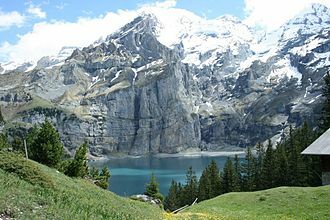 The name has been linked to the Latin term acer, meaning sharp or pointed, the Eiger is located within the Bernese Oberland region of the canton of Bern, between the valleys and municipalities of Lauterbrunnen and Grindelwald. It is located 2.2 km northeast of the Mönch and 5.6 km northeast of the Jungfrau, the nearest settlements are Grindelwald and Wengen. The Eiger has three faces, north and southeast, the east ridge from the summit to the Ostegg, named Mittellegi, is the longest on the Eiger. The north face overlooks the pass and resort of Kleine Scheidegg, or more precisely the region east of it, the latter mountain pass lies between the valleys of Lauterbrunnen and Grindelwald and connects the lower Männlichen-Tschuggen range to the Eiger. Kandersteg is a municipality in the Frutigen-Niedersimmental administrative district in the canton of Bern in Switzerland. It is located along the valley of the River Kander, west of the Jungfrau massif and it is noted for its spectacular mountain scenery and sylvan alpine landscapes. Tourism is a significant part of its economic life today. It is a year-round outdoors mecca for hiking trails and mountain climbing as well as downhill, Kandersteg is first mentioned, together with Kandergrund, in 1352 as der Kandergrund. Prehistorically the area was lightly settled, several late-neolithic or early Bronze Age bows have been found on the Lötschberg glaciers and a Bronze Age needle was found in the Golitschenalp. From the Roman era a bridge and part of a road were discovered in the village, until 1909 Kandersteg was politically and religiously part of Kandergrund. In 1511 the parish built a chapel in Kandersteg, which survived the iconoclasm of the Protestant Reformation in 1530 and it became a filial church of the parish in Kandergrund between 1840 and 1860 and in 1910 became the parish church of the Kandersteg parish. A Roman Catholic church was built in 1927, traditionally the local economy relied on seasonal alpine herding and farming and supporting trade over the alpine passes. In the 17th and 18th centuries sulfur mining began in the Oeschinenalp, a match factory opened in the village in the 19th century to take advantage of the sulfur. 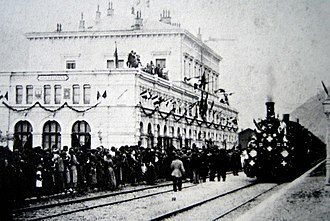 Beginning around 1850, the municipality grew into a tourist destination, between 1855 and 1890 five hotels opened and by 1913 there were 19 hotels. The population grew dramatically during construction of the Lötschberg Tunnel and the Lötschberg railway line between 1906 and 1913, the new railroad line and tunnel allowed ever increasing numbers of tourists to visit Kandersteg. A chair lift to Oeschinen Lake opened in 1948, followed by a car to the valley floor in 1951. A ski jump was built in 1979, the Kandersteg International Scout Centre opened in 1923. Kandersteg is located on the side of the Bernese Alps at an altitude of 1,200 meters above sea level at the foot of the Lötschen. 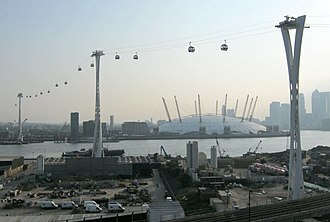 A gondola lift, as opposed to a cable car, is a means of cable transport and type of aerial lift which is supported and propelled by cables from above. It consists of a loop of cable that is strung between two stations, sometimes over intermediate supporting towers. The cable is driven by a bullwheel in a terminal, which is connected to an engine or electric motor. They are often considered continuous systems since they feature a haul rope which moves and circulates around two terminal stations. Depending on the combination of cables used for support and/or haulage and the type of grip, the capacity, because of the proliferation of such systems in the Alpine regions of Europe, the French language name of Télécabine is used in an English language context. Gondola lifts should not be confused with cable cars or the US aerial tramways as the latter solely operates with fixed grips and simply shuttles back and forth between two end terminals. In some systems the passenger cabins, which can hold between two and 8 people, are connected to the cable by means of spring-loaded grips. These grips allow the cabin to be detached from the cable and slowed down in the terminals, to allow passengers to board. Doors are almost always automatic and controlled by a lever on the roof or on the undercarriage that is pushed up or down, cabins are driven through the terminals either by rotating tires, or by a chain system. To be accelerated to and decelerated from line speed, cabins are driven along by progressively swifter rotating tires until they reach line or terminal speed, on older installations, gondolas are accelerated manually by an operator. Gondola lifts can have intermediate stops that allow for uploading and downloading on the lift, examples of a lift with three stops instead of the standard two are the Village Gondola and the Excalibur Gondolas at Whistler Blackcomb. In 1986, Doppelmayr built the worlds first eight-passenger gondola at Steamboat Ski Resort, such a system is called Pulse Cabin because usually more than one cabin are loaded at a time before the trip begins. The Jungfrau-Aletsch protected area is located in south-western Switzerland between the cantons of Berne and Valais. 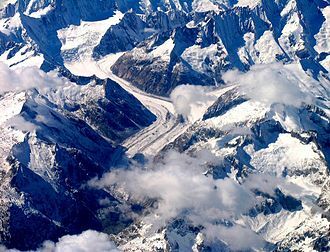 The Jungfrau-Aletsch protected area is the first World Natural Heritage site in the Alps, the Jungfrau-Aletsch protected area is located in the Swiss Alps between the Bernese Oberland and north-eastern Valais, about 25 km south of Interlaken and 20 km north of Brig. The site covers the whole Aar massif from the Oeschinensee in the west to the Grimselsee in the east, including the basins of the Aletsch, Fiescher and Grindelwald glaciers. The culminating point is the Finsteraarhorn which, with its 4,270 metres, is the highest mountain in the Bernese Alps. 8 other summits above 4,000 metres are located in the area, Jungfrau, Mönch, Gross Fiescherhorn, the summit ridge separating the cantons of Valais and Berne is the main watersheds of Europe. The southern valleys drain into the southwest running valley of the Rhone which flows into the Mediterranean sea, the climate of the region is strongly influenced by the height of the mountains. They form a barrier between the wet climate of the north and the dryer climate of the south-facing Valais slopes. On the north side the rainfall exceeds 2,200 mm, most falling in summer, the Valais experiences a subcontinental climate at low and medium altitudes and is markedly semi-arid. Mean annual temperatures range from -8.5 °C at Jungfraujoch to 9.1 °C at Brig, the Jungfrau-Aletsch site is almost untouched, except for trails and mountain huts. About half of the area is higher than 2,600 metres, the total area covered by glacier is 35,000 ha, it constitutes the largest continuous area of ice in the Alps. The largest and longest glacier in the Alps, the Aletsch Glacier is 23 km long and has a thickness of 900 metres at Konkordiaplatz. Glaciers and barren rock constitute 80% of the area, 6% is forested,5. 2% is alpine meadow, altitude is the strongest factor influencing the distribution and diversity of the vegetation. Within the nominated area there are 1,800 species of plants and 700 mosses. Lake trout is a freshwater char living mainly in lakes in northern North America. 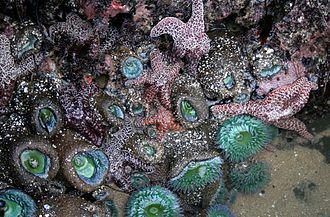 Other names for it include mackinaw, lake char, togue, in Lake Superior, it can be variously known as siscowet and lean. 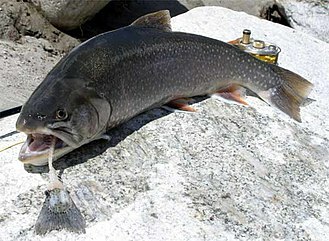 The lake trout is prized both as a fish and as a food fish. From a zoogeographical perspective, lake trout have a narrow distribution. They are native only to the parts of North America, principally Canada, but Alaska and, to some extent. Lake trout have been introduced into non-native waters in North America and into many other parts of the world, mainly Europe. Lake trout are the largest of the chars, the record weighed almost 46.3 kilograms with a length of 50 inches, the average length is 24–36 inches. The largest caught on a rod and reel according to the IGFA was 72 pounds, when hooked, especially the big ones will make a short run and just thump and twist and turn. Lake trout inhabit cold, oxygen-rich waters and they are pelagic during the period of summer stratification in dimictic lakes, often living at depths of 20–60 m.
Ice fishing in the Finnish Miljoonapilkki fishing competition. A lake trout in spawning dress. Oberaargletscher (left hand in the background) and Unteraargletscher (on the right). The small blue lake left hand in front is the Triebtenseewli.